The following letter was sent by the residents of Wharekaka Rest Home to the Prime Minister, Minster of Health and three Wairarapa members of parliament. We are the Residents of the Wharekaka Rest Home in Martinborough, South Wairarapa. Our home is ‘special’ as it is a small, community home efficiently run by a dedicated Trust Board, reinforced by an active Auxilliary group, and well supported by countless community members. It was with great pleasure that we were told of last year’s increase of wages for our carers who certainly go ‘above and beyond’ what anyone could expect in their care for us. They become our friends and we rely on them heavily in these later years of our lives. Thank you for realizing their worth to us and, at last, giving them pay equity. Because it is a small ‘not-for-profit’ organization we are treated as important members of a slightly larger family than the norm. We know each other well, are physically and socially catered for, and share our lives as a ‘family’ being able to voice our opinions in matters that concern our welfare and happiness: we are treated as family members. With Wharekaka being so central to Martinborough, moving into residence here has enabled us to remain close to our former homes and within easy visiting distance of, and for, our family members and friends. We remain a part of the community but are cared for as we need to be in a suitable facility. Wharekaka provides our township and rural community with this wonderful asset. Our location enables us to participate in all local functions if we so wish. Our Activities Officer ensures we are within the community wherever possible and we feel we still belong to Martinborough, that we are useful members of our society. We are also close enough for a large number of groups to visit us regularly. We have had many interactions with our local Council (through our Residents’ Advocate) and much has been carried out by them to enable our easier access to the township, hence assisting us to be fully interactive in our community. Through our meetings we are kept informed of all important issues that relate to our home. Although you, as Government Representatives, made the move to pay equity (which we applaud) we believe that the funding provided by you did not fully cover this increase in wages and, as a result, Wharekaka (being such a small organization) is struggling financially even further to be able to keep within budget. Poor funding is a real burden in our home. Larger organizations have more financial leeway to accommodate such increases as their financial pool is so much bigger. Our small home is vital to us and to our community – as it may be in many areas where small homes operate. It would be devastating for us if Wharekaka was unable to cope financially and had to close. We are requesting that you realize the difference between the vulnerable, intimate homes – especially run as Trusts – and the massive, money-making complexes when it comes to providing funding. Please fight for us by increasing government funding to fully meet all personel wages in our small, intimate and precious homes. We do not want to be left here in Martinborough without this valued asset for us, the elderly. GERMANY has launched the world’s first passenger trains that run on hydrogen. Unlike here in Wairarapa where the trains run on occasions. A REPORT show that half the people called for jury service get off. Last year 126 got off because they were dead. The report confirmed that ‘it was usually relatives of the deceased who notified the court why the jury service would be missed’. GOING ON a Cruise is like being in prison, with the added danger of drowning. THE CALIFORNIAN city of Lancaster has become the first zero carbon city in the world with its solar farm producing more electricity that it can use. The Australian city of Lismore is following suit planning to be electricity self sufficient by the year 2023. JAPAN has the most powerful passports, this based on the number of countries which will allow a holder Visa free entry. Japanese holders are allowed into 190 countries unhindered. Singapore comes second with 189 and Germany, South Korea and French holders third being able to access 188 countries without visa. IN THE 1800s every New Zealand settlement worth its name had its own hand set and printed newspaper. By 1864 there were already eighty seven titled papers in production. THERE ARE over ninety cities with free public transport. Fifty seven in Europe, two in Russia, and nine in Brazil. Public transport has been free since 1997 in the Belgium city of Hasselt. A DESKTOP computer running at peak capacity draws 175 watts of energy. A standard compact light bulb draws 15 Watts. The deadline for the Christmas issue of the Star is 4pm Wednesday November 28th It is always helpful to receive both advertising and editorial copy well before the deadline. Life Can be Fragile . . . so arrange someone you trust and understands you to become your Attorney to make decisions for you , if you may become unable to decide for yourself . Important to choose your attorney carefully. An Enduring Power of Attorney (EPA) is a legal document & protects you and what is precious to you. It will save your family the cost and stress of getting a court order to make decisions about you. There Are Two Types of EPA . . . a/covers your PROPERTY ie. Your money & assets and can come into effect before you lose mental capacity b/ covers your PERSONAL CARE & WELFARE and comes into effect only if a medical professional decides you have become “mentally incapable”. Once an EPA comes into effect , your attorney (or attorneys) can make most decisions about your care and welfare and your property (including finances). How Do You Get An EPA ? When you’ve decided upon your attorney & what you want them to do , you need to arrange a lawyer, qualified legal executive or a trust corporation like the Public Trust to be your witness. You can change your EPA at any time you are mentally capable. There are standard forms you must fill out to set up an EPA . You can get them from superseniors.msd.govt.nz or ask us at CAB to print them out . At CAB we also have very good pamphlets full of easy to read, further helpful information , published by the Office for Seniors . We are happy to supply them to you – call in or we shall post out to you if you phone us . The pamphlets are “Protect Your Future with an Enduring Power of Attorney” for yourself, plus “ Enduring Power of Attorney – Being Someone’s Power of Attorney “ for the person/s you choose to be your attorney. Equestrian teams from Wairarapa, Wellington and Hutt Valley colleges competed at the recent Secondary Schools’ Dressage competitions held at Solway. The Kuranui College equestrian team came in as very credible Runner Up in a large field, with Lucy Marshall also winning her age group. 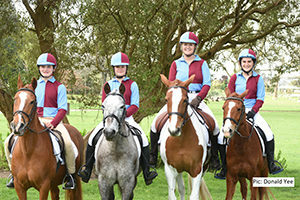 The Kuranui team: Sam Miller riding Queenie, Lucy Marshall on Benji, Samantha Levy with Eli and Piper Marshall on Ace.